Sad and breaking news from across The Pond … Margaret Thatcher has passed away following a stoke. The iconic, longest serving and most influential British Prime Minister of post WWII history has passed. Baroness Thatcher has died at the age of 87 after suffering a stroke, her spokesman Lord Bell has announced. Lord Bell said: “It is with great sadness that Mark and Carol Thatcher announced that their mother Baroness Thatcher died peacefully following a stroke this morning. From the UK Telegraph: She will go down in history not only as Britain’s first female prime minister, but as the woman who transformed Britain’s economy in addition to being a formidable rival on the international stage. Margaret Thatcher, the “Iron Lady,” the former UK Prime Minister and the first and only British female Prime Minister, has passed away at the age of 87. 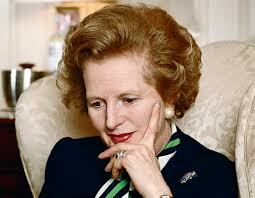 Margaret Thatcher served as Prime Minister from 1979 to 1990 as leader of the Conservative Party in England. The United States knew no better friend and ally than the British Prime Minister Margaret Thatcher. The Iron Lady along with US President Ronald Reagan helped end Soviet communism and helped bring down the “Iron Curtain”. She certainly put the “Great” back into Great Britain after years of floundering socialism. During her time at the helm of the British government, she emphasized moral absolutism, nationalism, and the rights of the individual versus that of the state — famously declaring, “There is no such thing as society” in 1987. Nicknamed the “Iron Lady” by the Soviet press after a 1976 speech declaring that “the Russians are bent on world dominance,” Thatcher later enjoyed a close working relationship with U.S. President Reagan, with whom she shared similar conservative views. Read the many tributes and condolences to the death of former British Prime Minister go to the UK Guardian. 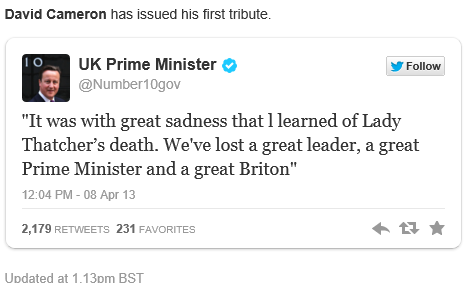 Current British PM David Cameron tweets a tribute to the “Iron Lady”. BBC: Ex-Prime Minister Baroness Thatcher dies, aged 87, tributes pour in for Margaret Thatcher. Lady Thatcher’s government privatized several state-owned industries. She was also in power when the UK went to war with Argentina over the Falkland Islands in 1982. 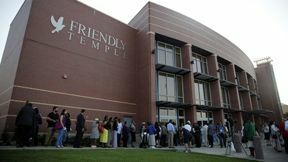 Take a good listen America, Great Britain, Barack Obama, Democrats and gutless Republicans. Listen to the brilliant words of Margaret Thatcher on government taxing the people … “No Nation ever grew more prosperous by taxing its citizens beyond their capacity to pay”. Margaret Thatcher owns the liberals and proves that Capitalism is better than socialism. Wake up America, England and Europe … her words still work today. Sadly, the miserable LEFT is just too quick to come out with the hideous comments following Thatcher’s death. Check out Jammie Wearing Fool for the soulless Left’s comments. These fools do not even comprehend the good this woman did and how their lives were made better. Legal Insurrection has it correct, we lost a giant of freedom and human dignity. Check them out for even more amazing videos and the words of Margaret Thatcher.